It’s not often that you get a chance to reflect and think about where the value in a particular funding stream lies. As a student with a Collaborative Doctoral Awards (CDA) from the AHRC, I was delighted to hear a conference had been organised to do just that. What made this conference more interesting was that it had been organised by students like me, and not the AHRC, the universities or institutions who have been part of shaping the scheme. The day was split into three, origins, innovations and legacy. The first session had Ian Lyne from the AHRC, academics Margot Finn from UCL and Trustee of the V&A, and Alastair Owens from Queen Mary University, and a CDA student, Jade French. The second session focused on the variety of projects CDAs can produce with presentations from past and present students. The final part of the day looked a legacies and had a mix of academics and heritage professionals that included Alexandra Goddard, now at the British Library Goddard focused on her work at the Geffrye Museum, Bill Sherman from the V&A and the University of York, Kevin Moore, director of the National Football Museum, Farah Karim-Cooper from Shakespeare’s Globe and Eithne Nightingale a current CDA student. More details of the programme and points for discussion can be found on the CDA Value website. I think the organisers did very well at trying to balance out a mix of presentations and discussion and from the first session it was clear many people in the audience had questions and experiences they wanted to share. I was interested to learn that the model for the CDA had been borrowed from the sciences and were originally designed ten years ago to meet the perceived gaps in knowledge observed by cultural and heritage institutions. In the ten years CDAs had been running it had become clear that there is no specific model for a CDA. They could be part of a heritage institution or other cultural institution, designed by the either a university, the cultural institution or by the student. Jade French was a perfect example of the project originating from the student and so able to design a process and area of study. This is very different from my experience of applying to a university to study a fairly vague topic and being given free reign in an archive. As part of the origins discussion I thought one of the most important points raised was by Margot Finn (who raised many other important issues), that ultimately a student has to complete a PhD, and as part of this the University has a responsibility to train and prepare the student to create and write their own academic projects. At one point the audience was asked if they planned to pursue an academic or heritage career post-PhD, and the split was about 50:50. Consequently it was evident that important questions need to be asked about how well the CDA can train students for either. Though because they are all so different, I think it is important for the students to communicate their ambitions to the university and cultural institution and look for ways to develop their training. An advantage of the CDA that was outlined was the access for students to these institutions, and from my own experience I would argue the CDA experience is partly what you make of it. Use these contacts and don’t be afraid to ask for help or training. Having said this a reoccurring theme or question that was asked was about the nature of collaboration, and even power, where did it originate and how did the student fit into this? Some CDA projects have an outline of work at the cultural/heritage institution and ideally that needs to fit with the student’s ambitions (hopefully discovered at the interview) and also be allowed for within the scope of the PhD. The funding currently lasts for three years and it can be very difficult to train in another discipline and conduct research in that time let alone write up a PhD. So yes, it is what you make of it, but this has to be negotiated within the parameters of the demands of a regular PhD workload and the needs of the institutions you work with. From my own experience, to ensure I maintained some practical museum experience I started my PhD part time and worked at a museum alongside my research. This was useful as it gave me time to explore my research area and find my research questions and topic for my PhD, but it did give me more distractions and it felt the PhD was dragging at times. To help develop my relationship with the heritage institution my CDA was with, the British Postal Museum and Archive, I decided to undertake the Associateship of the Museum Association. This involved a work-based-project and I completed this with the BPMA. I am yet to have my professional review, so I’ll have to let you know if that was ‘successful’, though I can say it did develop my knowledge and skills in a particular area of the BPMA’s work that I wouldn’t have encountered without the AMA. I am still working on my PhD and so I was very interested in the final session on legacies. From this discussion it was evident that collaboration and skills of working across institutions will be valuable in the future job market. I was also happy to hear that both Sherman and Moore had experience of working both at museums and academia, and that these are two careers can collide. Unlike many of the audience I haven’t decided, or don’t want to choose, between academia and heritage, and I hope there is scope for work across the two. I see the development of public history as part of this and I think it is an area CDA students should be increasingly aware. One of the main advantages of a CDA is supposed to be the opportunity for students to have an outlet to the public, to gain experience in public engagement and sharing their research with the outside world. I think that this can sometimes take some time to be realised, especially as PhDs can be slippery beings, designing an exhibition on your topic might only appear possible after you’ve submitted. However, I think CDA have a unique position standing between universities and cultural institutions to understand the challenges and opportunities of using research to engage the public. All in all it a useful and interesting day. As JD Hill identified in his final reflection, there are still areas to be explored further. The AHRC have announced that funding for future CDAs will be for longer than three years, meeting one criticism that has followed the programme for the past decade. However, other issues around funding remain. When a studentship is granted the amount is based on the location of the university not the partnered institution. So a student could be partnered with a London based museum or archive, and so need to be based there to do research, but because their university is outside of London their funding will be without the substantial London weighting. It is also important to think about how this stream of funding can be exclusive, prominently granted to large cultural institutions with a heavy focus on heritage, where as smaller institutions could benefit as could other humanities subjects such as philosophy, law or media studies. There is also the struggle with pulling all of this new knowledge together, do we need an online platform to share resources, challenges, methodologies and discoveries? Hill concluded with the idea that CDAs had changed the nature of knowledge coming out of universities. I’m not sure if this is true, but from my day in a room full of academics, culture professionals and students I did feel that we were at the forefront of an important shift in producing research, and that we need to ensure students feel empowered to do more with this and meet their ambitions. There are a lot of pop-ups in London, so many in fact there is a dedicated London Pop-ups website to find the most recent creations. They cover restaurants, shops and clubs, there are also art exhibitions, the most recent lists is an exhibition of ‘Breaking Bad’ character portraits that popped-up in February. 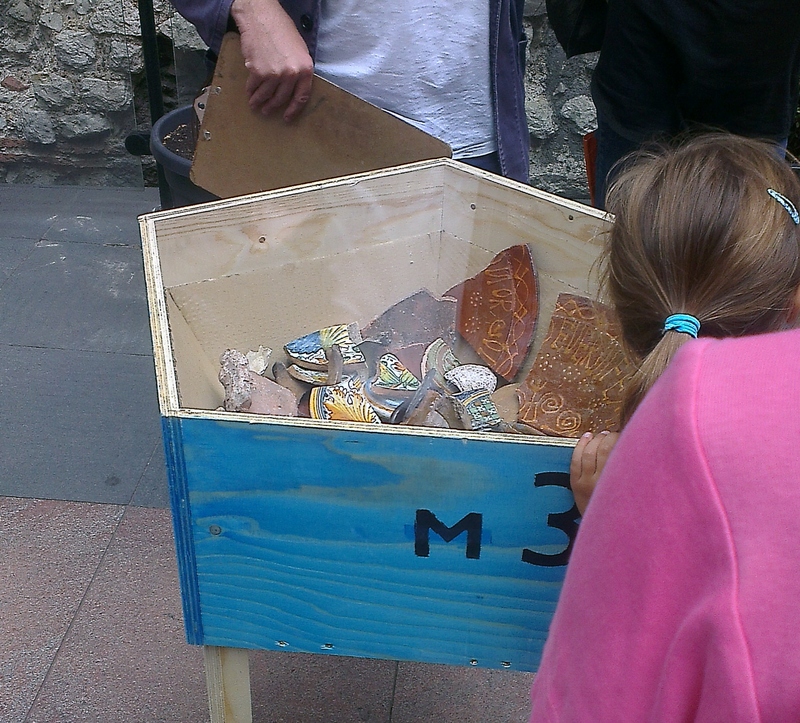 However, though museums are often the location for these pop-ups, it’s not often that you see a pop-up museum. Yesterday, I was lucky enough to go and visit one. The 100 Minories pop-up museum showcases the discoveries of an archaeological dig that took place before construction at 100 Minories, a patch of land just north of the Tower of London. The location of the dig is enough to spark my interest, but I also love the idea of a pop-up museum, and it is something that is very well suited to archaeological digs. These digs are normally temporary, they occur within a finite space within a finite amount of time and then must pack up and leave. The temporary nature of the research suits a temporary exhibition, and allows the exhibit to be close to where the action took place, something so valuable when you’re trying to imagine how the space was once used and the people that walked those streets. 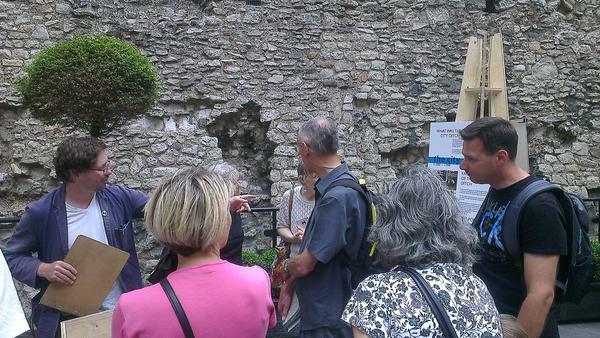 The museum of display panels and temporary cases are kept within one of my favourite sections of the old London Wall, a space just off Cooper’s Row in a hotel car park. This isn’t directly next to the site, but the explanation boards and particularly the tour are very good for helping you get a sense of your position in relation to the site. The history presented is a wonderful example of change and adaptation in London. The oldest parts of the site date back to the London ditch, the defensive moat situated outside of the Roman and Medieval London Wall. The ditch was filled in and by the seventeenth and eighteenth century we have houses and warehouses on the site. There are hints of different land uses, with a reminder of the close accommodation between animals and people. From the Georgian period and into nineteenth century saw huge upheaval for the site as it was flattened and redeveloped, a fate that appears to be continually repeating itself following Second World War bomb damage and obviously the current construction work. I don’t want to give too many details of the history as there is a lot for you to discover for yourself, if you have the chance, but I will mention a couple of areas I found particularly interesting. The site is an area that was on the boundaries of the Tower authority and City of London authorities, and there is a possibility the project has turned up evidence of the medieval boundary seen through methods of maintaining the London ditch. I find the subject of the Tower Liberties fascinating and not only is physical evidence of a possible medieval boundary line of interest but also the implications for administration and maintenance of the site. I wonder how much input the Tower had on the continual redevelopments of the area. As part of this, I was intrigued by something that simply featured as a sentence on a panel. The site was first flattened for redevelopment in the Georgian period and it was noted that they have yet to find evidence of a local reaction to this. What happened to the residence? Were there protests? With some much similar activity going on all over London at the moment in the name of regeneration and improved housing, it is a notable reminder how London’s landscape has been continually changing for hundreds of years, and how the voices of the displacement and removed are often lost in these stories. There is so much scope in this project and it’s great to see so much being done with it. If you have a chance to explore the project’s 100 Minories website you can see there are plans for a work of creative writing, a digital iterative map and importantly the archaeological findings will be shared on an online Archaeological Recording Kit (ARK). Today is the last day of the pop-up museum and I strongly urge you to pop along if you can. The museum is up from 12pm until 5pm and there are tours at 12:30pm and 3:30pm. “Last Post” panel with my research! I’ve been researching the Post Office and its workers for a few years now. This research has obviously focused, prominently, on the nineteenth century and my PhD. Yet, thanks to the collaborative nature of my PhD, I’m able to venture into other aspects and time periods as requested by the British Postal Museum and Archive (BPMA). Last year, unsurprisingly, I started to looking into the Post Office during the First World War. Due to the size and nature of the Post Office at this time (largest single employer in the UK, and the “friendly” face of government in every town and city) it has been fascinating.My research took me into the lives of the workers as I found reminiscences and oral histories and could compared these to the official records and reports. Experiences were varied and complex but involved men, women, boys and girls from all over the country. As a result of my research I contributed to the ‘Last Post” exhibition displayed in physical form at Ironbridge, and also online here. I also gave a paper at the Anglo-American conference and a longer paper at the BPMA as part of their public talks programme.You can download my talk, along with some of the other fascinating talks in the series, as a podcast from here. Most recently I’ve written a short blog for the new website for the ‘Everyday Lives in the First World War’ Research Centre. You can find it here. This is an amazing project that will look to further our understanding of what life was like at home for people during the conflict, from food to theatre, it’ll cover all sorts of topics and work with a range of groups and people in the process. You can find out more about the centre here, and do contact them if you’d like to get involved! So, 2014 might be over, but it’s only the start of the First World War centenary, so keep an eye on the ‘Everyday Lives’ project for events, and if you’re interested in hiring the “Last Post” exhibition do contact there BPMA. You can find out more here. I’m currently doing some work the BPMA on their war memorials collection, and I look forward to sharing more about that at a later date! It’s over. After months of planning, countless emails and a few trips to Derby, it’s over. MuseomixUK 2014 ran from Friday 7 November through to Sunday 9 November with a showcase of the prototypes on Monday 10 November. And what a weekend! Lots of carbs and caffeine saw us through the long days and I’ve been in awe of what the teams made. It was odd not being on a team this year, but it was nice to be allocated to one team to keep them informed of their deadlines and help progress where I could. This meant I didn’t really feel ownership of any of the prototypes, but I did get a better idea of what was going on elsewhere rather than being in the bubble of a team. I was also looking after evaluation which meant I got to work with Derby Museum, as well as our student volunteers, to develop a visitor evaluation. I was also attempting to monitor the changing emotions of the participants, but more of that later. Firstly, I want to mention the team I worked with. They were ‘Museums as Conversations’, and as a facilitator I was very fortunate that the team worked very well together from the start. I’m not saying it was plain sailing from the get go. Saturday morning was a particular challenge as the team wrestled with their ideas and how they could be realised into a physical prototype. In that, I am also grateful to Dominic and Fraser from Mixed Reality (one of our sponsors) who helped talk them through the variety of tech possibilities. But I have to say that once that got their idea, and agreed, I did very little. I helped put together a to do list, gave them jobs and off they went. I was occasionally asked for tape or post-it notes and had a sing-along, but apart from that they got on with it. Amazing!! And what did they make? 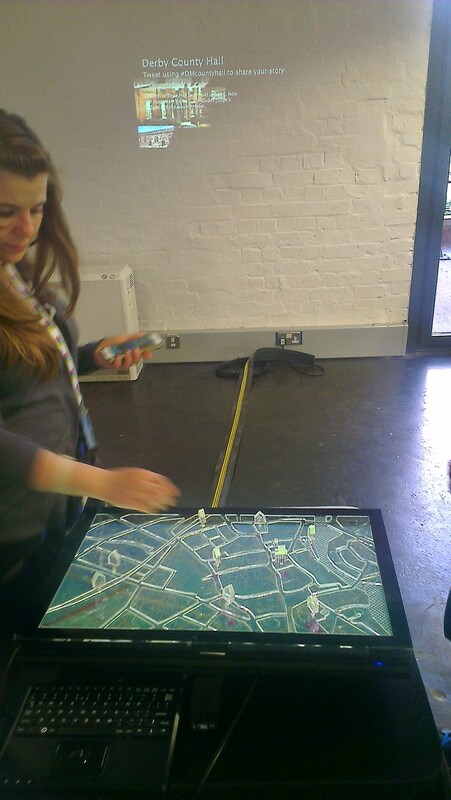 It was a tactile 3D map of Derby with particular places of interest available to be selected by pushing them down on to a touchscreen. This activated a projection displaying historic information on the building and a twitter feed that represented memories of that location submitted by the public. The central point of the prototype was that it stimulated and invited memories from the public.Consequently the group envisaged that a final product could have an interface that allowed people to contribute memories there, through a keyboard etc. The history of locations could also be connected to museum objects, so visitors could simply enjoy learning the history and seeing personal connections or use this as a stimulus for their memories or thoughts. Beautiful! Before I mention the evaluation process I was also looking at over the weekend I should also say a huge thank you to Dr Cath Feely and her five students from Derby University who gave up their time to help us. There were times when there wasn’t much to do, but having them there for the sudden ‘we need this’, ‘can you get this’ and as roving reporters was brilliant. They were also essential to putting together the brochure and tour for the public on the Monday, and they led some tours on the Monday and helped me monitor and think about evaluation. One of the students was keeping blog over the weekend, see here. Intriguing; Fun; Interactive; Tactile; Thought-provoking; Alive; Inspirational; Innovative; Crazy; Left-field; Exciting and Future! 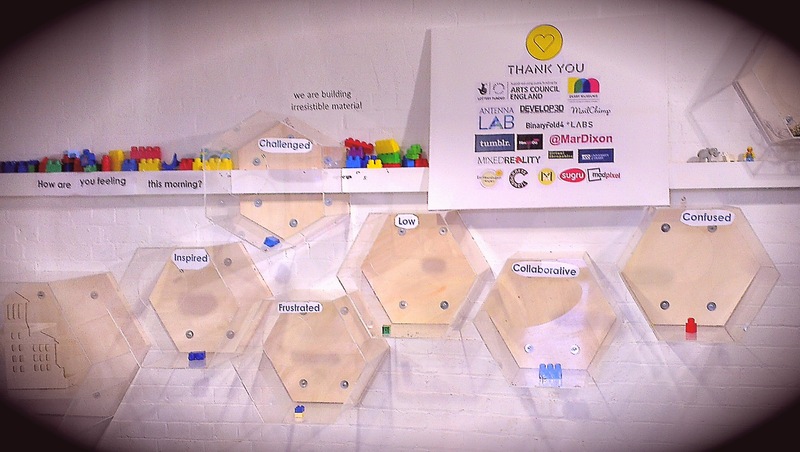 I was also using emotion boxes to attempt to monitor the emotional rollercoaster of MuseomixUK. This is probably not the most scientific method, but from the feedback of a few participants over the weekend, many found them therapeutic. Many people called for a tired box, I said I knew they were all tired and didn’t need a box to tell me, and other said the size of the blocks really mattered to them, so they’d put in a large block for inspired and a small one in frustrated. I hadn’t planned to account for the volume of the boxes, but may include it an anecdotal in my final evaluation. So far I’ve standardised the results and made this graph. What do you think?? 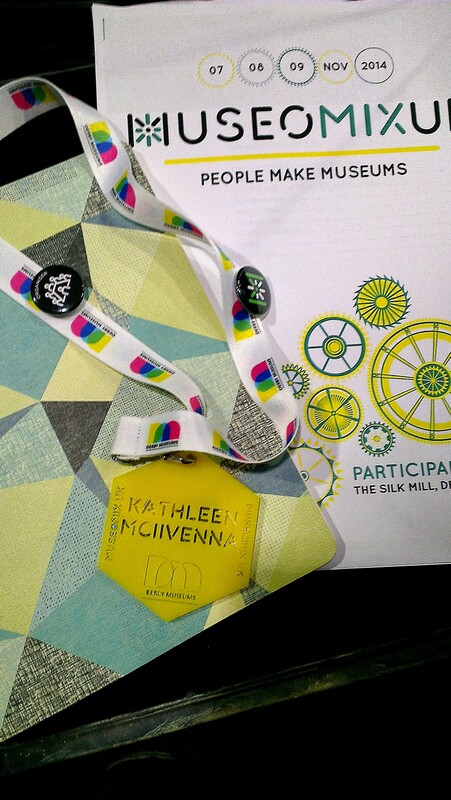 MuseomixUK aims to challenge how people view museums and themselves through openly promoting trans-disciplinary collaboration and building a supportive community. I realise I haven’t talked about what will happen over the weekend, but that doesn’t really matter at this stage. There is obviously a plan but i think the weekend will evolve as we work and create together. That’s another terrifying aspect, I don’t really know what the weekend holds: what personalities, what ideas, what technology what creations!!! I hope to blog again about my experience and my findings, and I hope you’re just as excited as me. We are quite clearly living through a revolution, the digital revolution. We can’t move for it, it’s infiltrated into so many parts of our working lives and leisure we’ve almost stopped being amazed or confounded by the possibilities or the consequences. 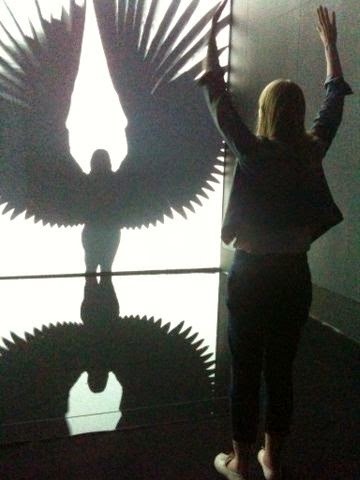 Almost, I say because I have been to the ‘Digital Revolution’ exhibition at the Barbican in London. My strongest feeling about this exhibition was that it was a lot of fun. From playing Tetris on an original Game Boy and watching how the film Gravity was made, to seeing my shadow sprout wings and shooting robots with my mind. I had a lot of fun. And that was only the first part of the exhibition! The exhibition is spilt into three areas across the building and the first section is by far the longest with the most to say. It was a real novelty to be able to not only see but use and play with original games consuls, and as you can probably tell the Game Boy was my favourite. Why? Because I had one of course! Though novelty and nostalgia are not the only interesting aspects of the exhibition and the development of games and art feels pioneering and democratic. The best example of this has to be the system that was to become the internet, Tim Berners-Lee’s Enquire system. It doesn’t look like much but just look where we are now! The exhibition moves into the present and consequently the future as the screens slowly disappear and the digital world becomes more reactive. The big finale is a room in the basement which is dark a part from a few beams of light. It is quickly apparent these are more than spotlights, they are lasers and they dance and explode at your touch – so much fun! All of this was exciting and though the exhibition focused on games and art it made me think about what these developments could mean for the wider world. The technology linked to the game using eye movement and brain power appears ideal for people with severe paralysis. Could the artwork that gave my shadow wings be used to any benefit in discussing issues surrounding body-image or self-image? I have no idea. What I do know is that it got me excited about the possibilities for museums and how the digital revolution can help us look at the world, objects and ourselves a little differently. Museums are using digital to increasing effect and it is becoming clear that interactives no longer need to be these touchscreens on gallery, they can be much more. I’m obviously not the first to think this and there is already great work being done to explore the possibilities. The V&A commissioned a games designer in-residence, whose final game should be released soon. I’m totally fascinated by the Battle of Bannockburn heritage centre where visitors are emersed in the history of the battle, its characters as well as its arms and armour then invites you to play out your own Bannockburn. 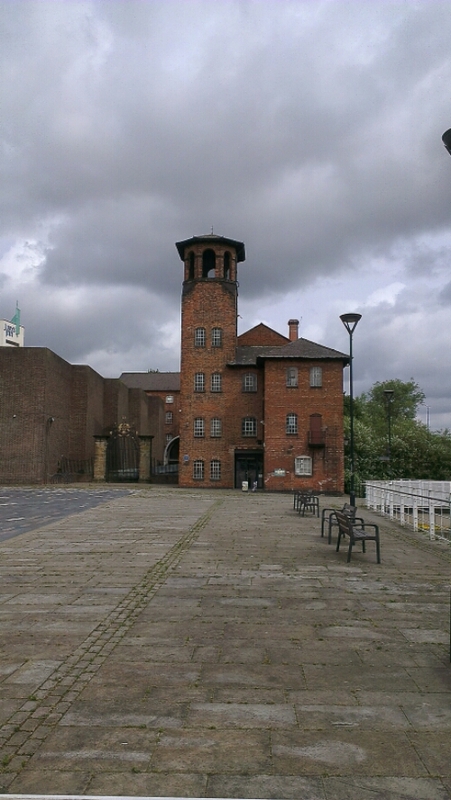 Derby Museums have taken the ethos of creating and collaborating to it’s core in the Re:Make Museums project at the Derby Silk Mill, asking visitors to be creators and help shape the museum, they’ve even agreed to host MuseomixUK this year! I think museums can demonstrate some of the best ways the digital revolution can work, encouraging collaborative and inclusive participation. I also think they are well placed to discuss the darker side, the issues surrounding surveillance, abuse, theft, privatisation of data and civil liberties. The issues that are not necessarily easily understood but are of increasing importance as we spend more of our working and leisure time in the digital realm. 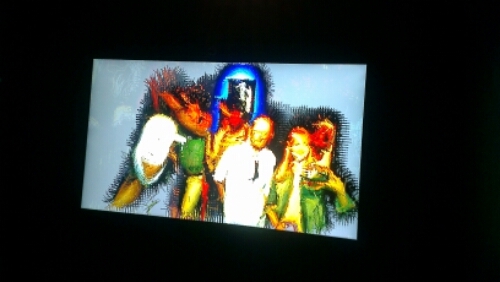 But let’s end on a positive note and get excited about the future of digital and the future of museums! Long live the revolution! It has recently been reported that the now privatised Royal Mail is going to start delivering post and opening delivery offices on a Sunday. This has been billed as ‘new’ and ‘innovative’, however it would be more appropriate to bill it as ‘returning to its roots’, because post on Sunday is nothing new. Historically the Post Office had always operated on a Sunday, there were a few anomalies the most significant being London, but the rest of the country were able to send and receive mail on a Sunday.This was a well defended Post Office principle during the nineteenth century, a government department that championed its convenient and efficient service for the people of Britain. The Sunday service only ended in the First World War due to attempts to cut costs and pressure on the diminished postal labour force. 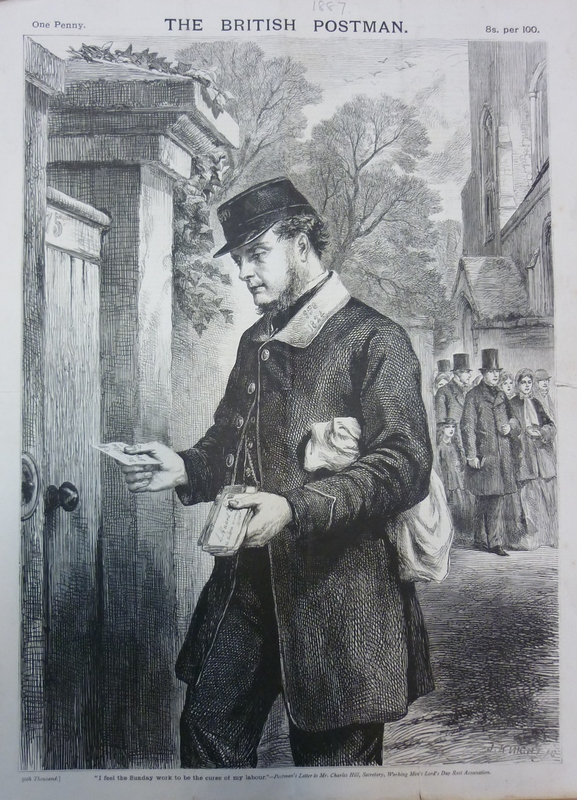 My PhD looks at the nineteenth century Post Office and my recent work has focused on this Sunday service and an active and occasional powerful campaign to stop the regular postal deliveries on a Sunday. This campaign was led by people labelled as sabbatarians, who felt that God had decreed that no work should be done on a Sunday. 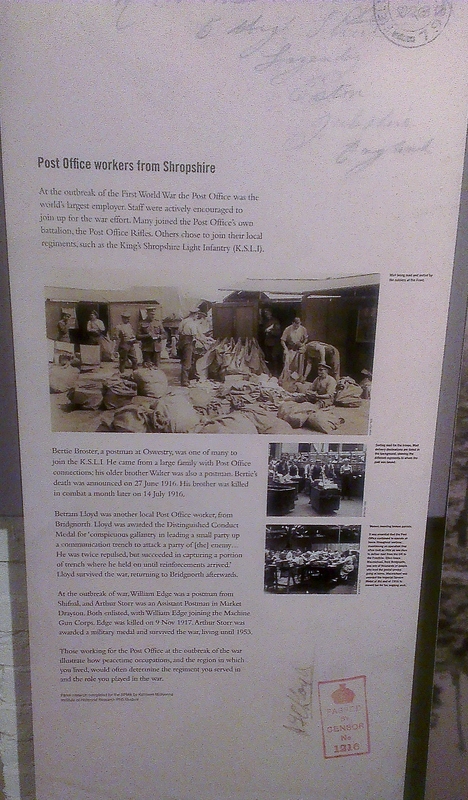 Work included the work of the Post Office’s sorters and letter-carriers as well as the reading and writing of letters by businesses and individuals. For the campaigners they saw this as much as a humanitarian and protective issue as religious. The sabbatarians campaigned hard, and their biggest success was in 1850, when they managed to secure the legislation they desired ending all Sunday deliveries and collections. The success was short lived as a political backlash called for an inquiry and the Act was amended to allow local postal districts to chose if they wanted the service on a Sunday or not. 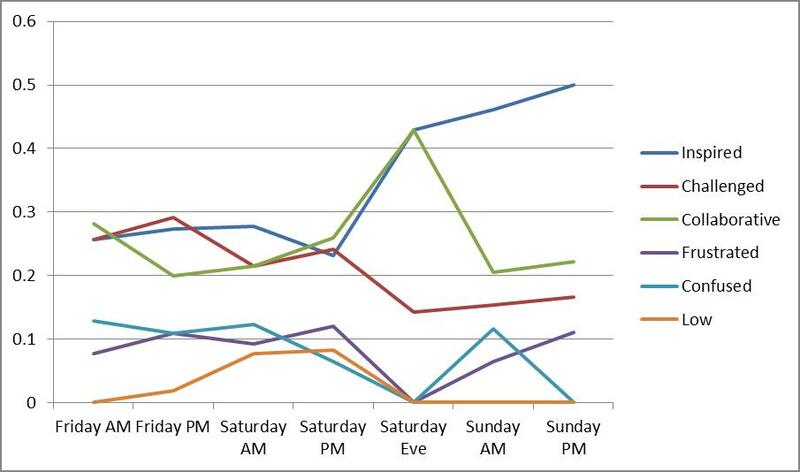 Individuals were also allowed to opt-out of a house delivery on a Sunday if they could not gain a majority support. Religion was obviously important in the arguments to end Sunday work, and went hand-in-hand with campaigns to close museums, shops and public houses on a Sunday. But the arguments to keep the service are similar to the ones put forward to restarting the service today, those of convenience and providing an efficient service. ‘grave inconvenience has frequently been caused by the non-delivery on Sunday of important private letters (especially in cases of sickness)’ [POST 14/22]. For the people of Maindee near Newport, Monmouthshire in 1856, it was more a matter of business for a growing area. However, even this was countered with arguments that Londoners simply used the post offices on the edge of the metropolis to send important messages. Furthermore, with changes made to the service to ensure provincial post offices could reduce their hours on a Sunday work had to be done in London, such as sorting and transmitting mail. The move to reopen post offices across the country for the convenience of the public could be seen as a return to the Post Office’s Victorian values, but I feel that what the Communication Workers’ Union (CWU) have stated is also significant. They welcome these changes but make clear that the Sunday work would be voluntary and on a higher scale of pay. I think this is the real legacy of the nineteenth century. Religious principal may have been the bedrock of the Sunday Labour campaigns of the nineteenth century but they were also part of a movement that promoted the welfare of the employee within the corporate aims of profit and efficiency.